Unfortunately, none of my classmates were at the event. I met a few of our Professors, who luckily did remember me. The meet started with lunch at my department (Department of Computer Science), thought I knew where the building was, but I was wrong. I was asked to go to the other end of the campus. Phew! That was a huuuuge building, we had just one floor during our days. For those who study abroad they may feel this building is nothing big but for me, it was an impressive building. Every classroom with an overhead projector, neat benches, labs with 50 new computers – we had none of these. But we did have India’s first 24 x 7 x 365 computer lab which has helped us come a long way. We had an interactive session in the seminar hall in the department on how can the alumni be involved with the college. Suggestions were going in all directions until the recently retired principal Prof Sangameshwara brought everybody back to earth and asked the group to get realistic. To start with alumni should become a member of our official portal. Old block building [photo] – a very ancient building in our campus built by the Maharaja of Mysore before SJCE was founded. It was a hostel earlier (I stayed in OB3), then it became the VTU office and now it is vacant. Big banyan tree [photo] – college had decided to cut it down, students apparently formed a human chain to protect it. It still stands tall and strong. Prof Dhananjaya said these two landmarks will never be brought down ever because they bring the much needed “connect” when alumni visit the campus. I relived that feeling when he said that. Thank you sir for keeping them alive. Both Jayeshankar and Srinivas are high achievers in their own fields – they stuck to their engineering fields. But my focus is on cricket speedster Javagal Srinath because he changed his field. 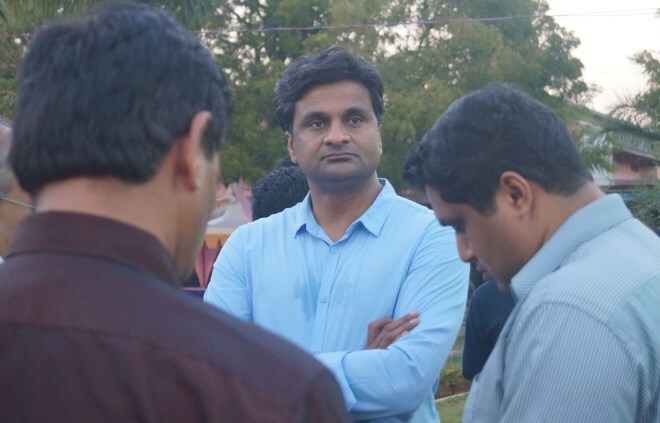 The highlight of the evening was definitely Javagal Srinath’s speech. I had seen and heard him only on TV (cricket match coverage). He started tickling the crowd from the very first sentence. I had to tweet immediately during his speech. He, directly and indirectly, told several times he wasn’t a brilliant student during engineering. He wanted to join SJCE only because from the 8th grade he had heard of ‘sjce’ a zillion times from his elder brother Javagal Srinivas and friends. He just wanted to join SJCE and it happened to be an engineering college! Fate took him to Malnad Engineering college in Hassan. He managed to take a transfer to SJCE in 3rd year only after he met the condition put by our then principal Prof M.H. Dhananjaya – he should pass all the subjects he was carrying! He had a dream of developing a statistics program, approached Phoenix Global Systems, headed by Satish Bangalore which was employing many SJCE alumnus. That made it easy for him to get a product developed which was in demand from all cricket associations. He had a dream of developing a world-class cricket pitch in Mysore. As Honorary Secretary of KSCA, he developed one in SJCE campus with the help of college officials. Srinath said he always had a vision and got it implemented by others. He never dreamt of being a rank holder in SJCE because nobody else could implement it for him. The crowd was roaring with laughter. He was able to carry the weight and responsibility of Indian bowling attack on his shoulders because he was accustomed to carrying many subjects during engineering. He was humble and modest enough to thank Prof Dhananjaya several times to be the turning point in his life. I was told later Srinath’s brother J. Srinivas was my classmate (nickname Keppa), strange I don’t remember him. My classmate Vikas Kamat sent me a photo taken with “my camera” – Javagal Srinivas hugging me on a slide (jaare bande). Hmm..no memories of anyone hugging me (during college days I mean!). 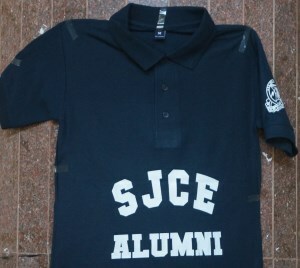 Requesting other SJCE alumnus to register themselves on our alumni portal. ತುಂಬಾ ಚೆನ್ನಾಗಿ ಆ ದಿನದ ಆಗುಹೋಗುಗಳನ್ನ ಬರೆದಿದ್ದೀರ. ಶ್ರೀನಾಥ್‌ರಿಗೆ ಕೆಎಸ್‌ಸಿಎ-ಯ ಆಡಳಿತಗಾರರಾಗಿ ಇನ್ನಷ್ಟು ಅವಕಾಶ ದೊರಕಬೇಕಿತ್ತು. Perhaps KSCA being KSCA, does not deserve such meritorious administrators.